The Raspberry Pi 3's primary heat source is its central processing unit, the BCM2837. The heat generated by the chip (shown in Figure 1) is investigated here using three sensors simultaneously monitoring temperature. A thermocouple was placed atop the ceramic casing, an infrared thermometer was pointed at the casing, and the CPU's internal temperature readout were used. The behavior of the chip was studied under various operating conditions in the form of CPU percentages ranging from 5%-82%. Three separate cooling methods were also explored using ambient air cooling, fan cooling (13 CFM), and a fan-cooled aluminum heat sink. The goal of this experiment was to investigate cooling and heat generation of the CPU under exertion conditions within the computer's operating range. Figure 1: The Raspberry Pi's main chip: Broadcom's BCM2837. Figure 2: Wiring diagram for IR thermometer and thermocouple to Arduino Uno. Figure 3 (below): My setup for the IR thermometer, type-k thermocouple, DC fan, and Raspberry Pi measurements. This experiment relies heavily on 3rd party libraries from Adafruit and Sparkfun. The MAX6675 needs Adafruit's library located on GitHub, here. The IR thermometer (MLX90614) needs Sparkfun's library also located on GitHub, here. You can find a great tutorial on the MLX90614 here as well, if interested. I combined the examples from each library and outputted the values to the serial port to allow Python to read the values on the Raspberry Pi end. NOTE on IR Thermometer: I am using two surfaces with the infrared thermometer. The first is the ceramic casing of the RPi CPU, and the second is an aluminum heat sink. Below I listed the rough experimental values for emissivity of each material. I will note that the emissivity for the heat sink was not quite accurate, but this may be something that I will investigate in the future. There is a noticeable separation between thermocouple and IR thermometer during the heat sink experiments. I believe this is due to the thermometer measuring the entire heat sink and the thermocouple was measuring only the base of the heat sink. I also think the emissivity is likely around 0.2. Now that the Arduino is outputting values to the serial port, we want to read the data on the Raspberry Pi end. The Python code below parses grabs data from the serial port and saves the values to a CSV file. Along with the IR temperature and thermocouple datapoints, I have added a timestamp and the RPi's internal temperature reading. The resulting CSV file contains four columns: timestamp, infrared temperature reading, thermocouple temperature reading, and the internal RPi temperature reading. With the above code, you can produce CSV files that contain real-time data that will allow you to plot heat transfer data from the RPi. The video above shows the characteristic output form the Python script. Now that the wiring and coding end is complete, I will cover my stress procedure for the RPi so that we can investigate several operating conditions (within normal operation) and increase the chip's heat generation. Figure 4: CPU percentages shown in a temperature plot, indicating the correlation between CPU and heat generation. I'm not sure whether the Pi has a background optimization routine that would automatically limit CPU usage, and therefore it is not clear to me whether the CPU percentage is indicative of the true exertion of the CPU. But the simultaneous run of several loops like the one above exhibited increased usage of the CPU chip, so I assumed the CPU would heat up with each loop. And judging by the temperatures recorded below - this was an accurate assumption to a certain degree. Where qs is the heat flux, h is the heat transfer coefficient (usually between 3-10 for natural convection indoors),Ts is the surface temperature, and T∞ is the ambient temperature. Where qs again is the heat flux, k is the thermal conductivity of the fluid (air), NuL is the Nusselt number (explained below), Ts again is the surface temperature, T∞ is the ambient temperature, and L is the length of the flat plate (microchip). This result is profound in our particular case because it states that: measurements of CPU under natural convection, information about the geometry of the surface, properties of air in the specific case, and the velocity of the cooling fan can help us predict the surface temperature of the chip being cooled by the fan! Now that I have described the experimental setup and introduced some simple heat transfer concepts, it is time to analyze the data. Below in Figure 5 are my measurements of the CPU temperature for three cases: no fan or heat sink, fan only, and fan and heat sink. For the heat transfer analysis, I will only be focusing on the 'no fan or heat sink' and 'fan only' cases. After taking the values for surface temperature from the figure above, we can begin our heat transfer analysis. In the table below, I have outline the state variables (taken from engineeringtoolbox.com) used in my calculations under my specific experimental conditions. Using the values above, we can now construct a prediction using the equation for Ts. In my case, I found that hnc = 13 was the most accurate heat transfer coefficient under natural convection. This aligns with experimentally-held results. Below is the surface temperature prediction using only the temperature data from the thermocouple without a fan or heat sink and the heat transfer equation above. Figure 6: Using the heat transfer approach, the predicted performance of the fan is closely approximated for the lower power states, but struggles at the higher states. 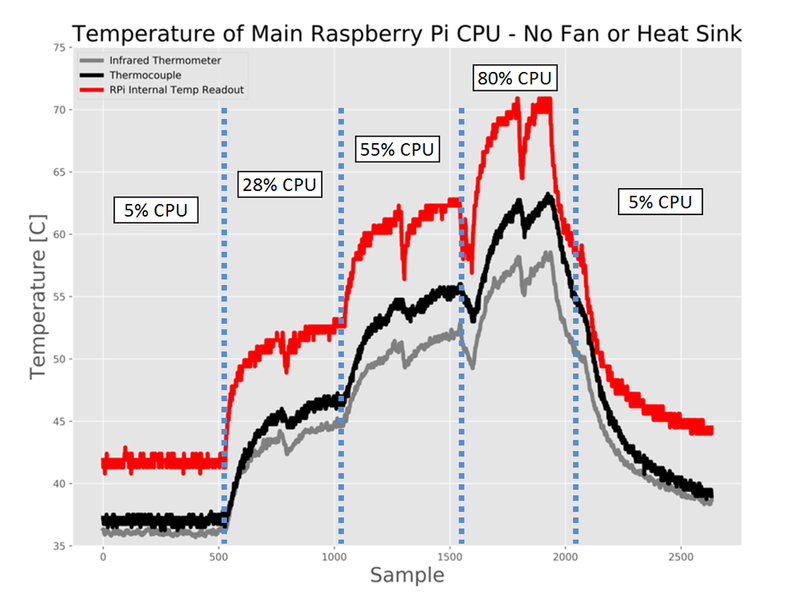 I believe this is because the Raspberry Pi is operating in such a way that it is able to optimize the CPU after being cooled by the fan. This would create the lower temperature shown in the Blue. My prediction (in Orange) follows the Green line because it is predicted from that data. I believe if the RPi was running identically on both runs, the Blue line would mimic the Orange, however, in this case it appears something else was happening with the CPU. The positive observation is that the return back to low power (the tail end of the data) follows nicely between Orange and Blue, indicating good agreement between the predicted heat transfer performance of the fan and the actual data taken from the fan-cooled CPU. In Figure 6 above, it is easy to see that the heat transfer prediction does a good job at predicting the surface temperature for the first two periods (5% and 28% CPU), then struggles during the third (55%), completely fails on the fourth (80%), and then realigns during the fifth (5%) period. I believe this is due to internal CPU conditions that change based on the temperature of the chip. For example, if the chip begins heating excessively, the internal temperature sensor will flag the chip and cause it to alter its running procedures. In our case, the fan cooled the chip enough that it was able to run more efficiently (a theory of mine), so it didn't need to approach a higher percentage of CPU to work. This indicates that cooling the main chip actually improves the performance of the CPU overall, which is a great conclusion to be drawn despite the disagreement in heat transfer conclusion. This experiment turned out to be lengthier than I had originally predicted. I began this experiment with the intention of comparing the MLX90614 and type-k thermocouple to investigate their relative calibration. However, I quickly realized that the experiment was more interesting as a heat transfer problem! I became more and more enthralled by the results from fan cooling as well as the heat sink, so I decided to continue investigating the problem. As a result, I was able to successfully predict the impact of the DC fan (under certain conditions) and create a qualitative understanding of the CPU heat generation. This type of experiment would be great for young college-aged engineers getting started with heat transfer and I may even introduce it into my own classes. I did not discuss the heat sink at length in this article because it introduces a completely different (and more complex) set of heat transfer skills. But I did conclude that the heat sink under fan-cooled conditions had a huge impact on the surface temperature of the CPU. 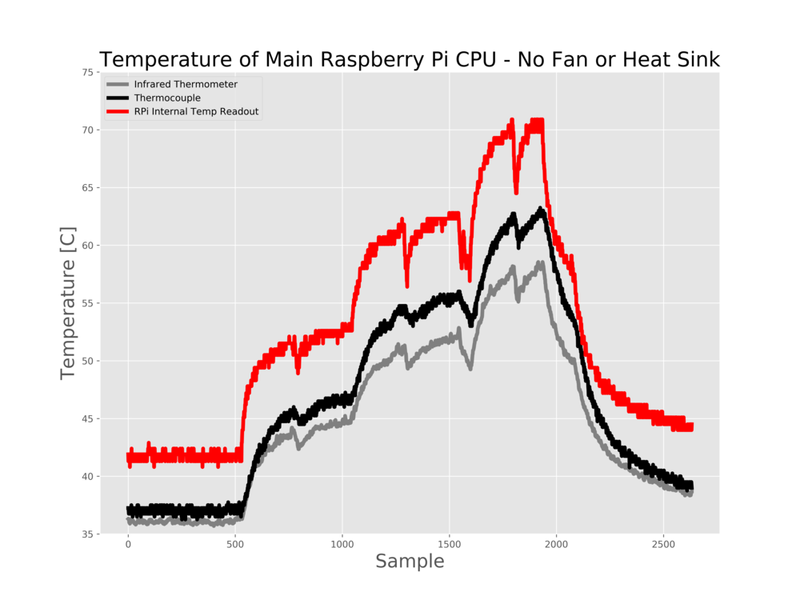 In the final figure, Figure 7, I have plotted all three sensors for all three cases of cooling. It is immediately obvious that the fan and heat sink combination result in a decrease in surface temperature by almost 10 degrees when compared to the fan-only situation and as much as a 40 degree temperature difference for no fan or heat sink case. What a result! Figure 7: Results from the three cases of cooling: ambient convection, fan cooling, and fan-cooled heat sinking. These results indicate that introducing a fan can reduce the surface temperature of the CPU by a few degrees to almost 20 degrees Celsius. When a heat sink and fan are introduced, we see a huge reduction in surface temperature, ranging from 8 degrees to nearly 40 degrees! This indicates, along with other features in the plot, that the fan and heat sink combination could increase the life of the CPU by reducing the core temperature and perhaps even improving the efficiency of the chip by maintaining the surface temperature without the CPU need to worry about overheating.